2017 was a momentous year for science and technology. It marked the 25th anniversary of the first SMS sent; the 75th anniversary of the first nuclear chain reactor; and 150 years since dynamite was patented. Tucked away amongst these milestones, but of no less importance, was the 80th anniversary of the discovery of polyurethane. It is unlikely that Otto Bayer and his team appreciated the future significance of their discovery when they landed upon the polycondensation reaction inherent to polyurethane preparation whilst investigating synthetic and cheaper alternatives to rubber. 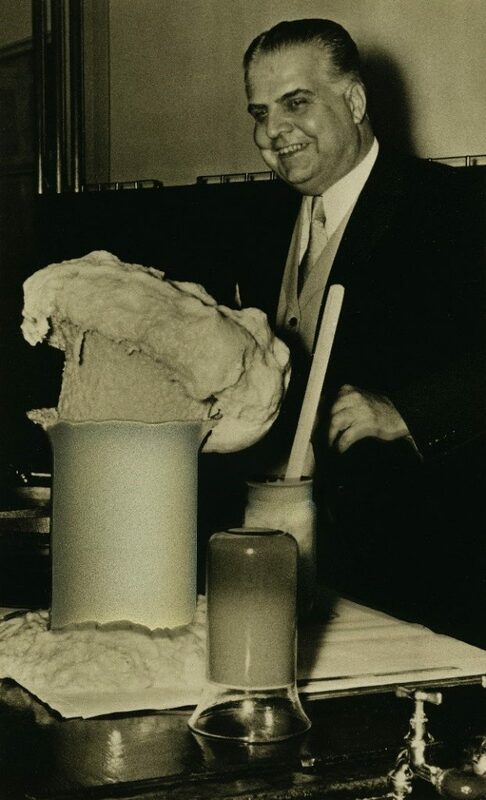 It is equally possible that the potential of this new product was still not fully appreciated when, in 1948, DuPont manufactured the first commercially available rigid foam for insulation. Nonetheless, the development of polyurethane has had far-reaching and long-standing influence as it moved out of the lab and became, perhaps unbeknownst to most, a consumer staple. By the end of World War II, for example, polyurethane was already being manufactured on a large scale for use as protective coatings. Rapid developments in the field enabled significant advancements in the applications possible for polyurethanes, which are now being developed by a number of companies worldwide – by 2019, it is expected that total revenues will reach USD$54.2 billion. Over time, we have seen the incorporation of polyurethane into all manner of applications – from beer barrel insulation, shoe soles, spandex, and spacesuit lining, to surfboards, footballs, FDA-approved artificial hearts and (for a limited time only) swimsuits. Polyurethane has clearly gone from strength to strength over the past 80 years, but what does the future hold? Simply put, the future is bright – the future is green. The climate change challenge – and the attendant social and political pressures – have resulted in a concerted push by manufacturers to cut emissions and reduce the environmental footprint of the heavily petrochemical and volatile organic compound-based materials used to make polyurethane. Ultimately, this is a change that also offers significant economic benefit upon replacing expensive feedstocks with a cheaper, natural alternative. In the last ten years, the industry has seen the introduction of sustainable polyols prepared using a variety of plant- and bio-based materials. While a step in the right direction, these feedstocks are inherently dependent on season and weather, so we must also consider the regulatory and ethical concerns of taking agricultural effort away from food sources, which may present a barrier to entry of these technologies in developing countries. A feedstock that is a waste product of other industrial processes would thus offer a holy grail to polyol synthesis. One such chemical springs immediately to mind: carbon dioxide. Consequently, scientists and polyurethane manufacturers across the globe are exploring ways in which to utilise CO2, one significant development of which is catalysts that facilitate its incorporation into polyols. This new technology not only replaces a significant amount of oil-based feedstocks with CO2, but also prevents further carbon emissions – saving money and the planet. What’s more, advantages of CO2-containing polyurethane can be seen through improvements in the flame retardance of rigid foams, and increases in the chemical, temperature and hydrolytic resistance of coatings, adhesives, sealants and elastomers. These catalyst technologies have the potential to transform CO2 from a harmful waste product into a valuable staple of the polyurethane industry. At Econic Technologies, we have taken this one step further: our pioneering tunable catalyst enables our customers to select the amount of CO2 incorporated into, and thereby the properties of, their resultant polyols. Furthermore, these polymerisation reactions can occur at much lower pressures than other similar systems, so our customers can retrofit the technology to their existing assets with an estimated pay back within only two years. Capable of saving 10 million tonnes of CO2 emissions each year (assuming 50 per cent market adoption) – the equivalent to taking six million cars off the road – our catalyst technology is part of the revolution that is adding significant value to the carbon recycling economy, and fundamentally reshaping modern plastics manufacturing. As we celebrate polyurethane’s 80th birthday, we confidently look forward to a bright, green future. To learn more about the endless potential that Econic’s catalyst technology can bring to waste CO2, check out how Econic can make this possible, or contact us for more information. This blog was first posted by British Plastics & Rubber on 05/02/2018. Photo of Otto Bayer courtesy of Bayer.